Sleek and simple are attributed to contemporary outdoor lighting fixtures. Although simple in design, they are very appealing because of their clean lines and elegant designs. Often you'll see these fixtures in more modern homes yet they serve two purposes. First and foremost, they serve as a source of outdoor lighting. Second and more importantly, they are decorative in nature and are pieces of art in their own right. Contemporary lighting fixtures come in a variety of fixture types from outdoor post lighting to outdoor path lighting fixtures, but where they differ is in their unique styles. With all the choices available, deciding on the right contemporary lighting fixtures can become a bit of a challenge. That of course is if you're not clear on what you're looking for. Because your contemporary fixtures will be showcased, you want to make sure to include them as part of your outdoor decore. Do this by deciding where you want your lighting fixtures to be placed. 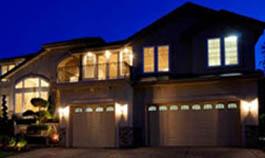 For example, are you going to be using outdoor wall mounted lighting fixtures on either side of your front door? Make it flow. Make sure the fixture's style draws attention to the structure's architectural style and it's surrounding environment. Maybe match the color of your contemporary fixtures to your home's vibrantly colored trim. Decide on what exactly you want to stand out or what currently isn't standing out that you would like to see more of. Then choose a lighting fixture to match or accentuate that feature. Matching up your contemporary outdoor lighting fixtures is a lot like accessorising your wardrobe. If you were to take a keen look at the clothes you wear day after day and add small accessories to accentuate your outfit, you could potentially create an entirely new look. The rules are the same for matching your outdoor lighting fixtures. Maybe you decided to match your new contemporary lighting fixtures to a modern houshold item such as a stainless steel grill. Selecting stainless steel contemporary outdoor lighting fixtures to match would make it flow together. Finding some key reference points throughout your landscape is key to matching up your lighting fixtures with your outdoor decor. This is an art, so getting good at this may take some practice. Positioning your contemporary outdoor lighting fixtures is just as important as choosing the right ones in the first place. You probably want the lighting fixtures you spent your hard earned money on to be seen. They are of course the crown jewels of your outdoor environment, so you may want people to recognize them. At the very least, you want your contemporary fixtures to enhance the overall feel of you're home's architectural style. Place them in areas that can be easily seen such as on your patio or deck, lining your pathway, mounted on your wall, or simply choose outdoor post lighting fixtures as a stand alone alternative. Any one of these methods will make your outdoor environment more welcoming as your contemporary lighting fixtures make you feel more at home.